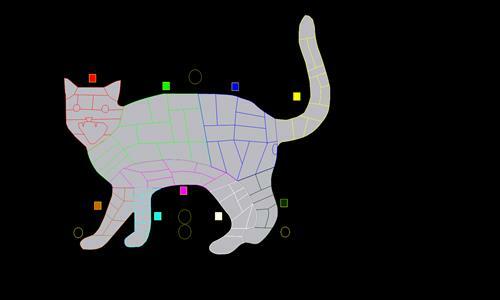 A map of a cat. All previous errors have been fixed. Review by noibatboy on 7/26/2017. The main forehead doesn't connect to either of the territories directly below the ears. However, I do like the map. Review by Kitler on 5/21/2018. Review by NinjaNic on 7/11/2017. Funny map, but eye 1 does not connect to the forehead. Review by Phakh Gokhn on 7/14/2017. Belly 3 (Belly bonus) and Heart 4 (Chest bonus) should connect. Review by Ailith on 10/20/2018.